Mane Style: Short, and neat. Tail Style: long and wispy. Oni's older brother, and the oldest Sorasousha. He was the first to leave the Neighpon Cloud Archipellago. 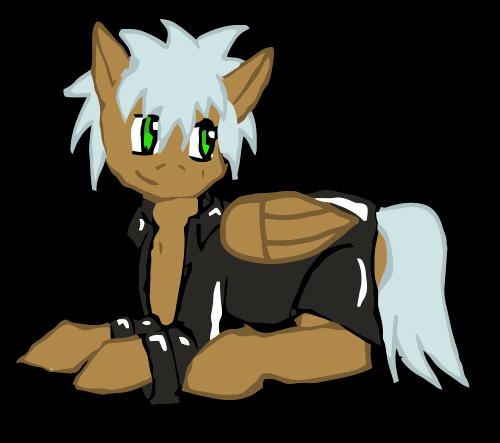 His cutie mark is a cyclone, and he specializes in whipping up and controlling the wind with carefully planned flying. He's nearly as smart as he is fast. Mane Style: Large spikes, similar to Ryoko from Tenchi Muyo. Tail Style: Three large spikes, similar to mane style. Oni's older Sister, and the second oldest of the Sorasousha siblings. Extremely Tsundere attitude. A bit of a brat who enjoys things to go her way. Her cutie mark is a Yo-Yo. She's incredibly adept at using them whether it comes to pulling off tricks, or even using them as impromptu weaponry, her skill with the toys, is unmatched. She often has at least two in her saddlebags, if not sometimes more. She left home in search of Kuro, and also out of curiosity of what was beyond the cloud city she grew up in. Tail Style: tied near the base, and up, similar to her mane. Oni's younger sister, and the youngest of the Sorasousha Siblings. She's quite calm for the most part and she is just a bit on the compulsive side. Her cutie mark is a feather duster, and she enjoys cleaning more than anything else. She's exceptionally good at rearranging things to fit in spaces that they ordinarily might not. She left home more out of curiosity, than a desire to find her older siblings who left before her, but she left even before Oni did. Descriptions and characters aside! what am I looking for? Players who are interested in building a bit more story, and _fit_ the characters given. Realize that, in a sense, I will be treating the trio like Canon Characters, in the sense that, if I don't like how someone is playing, or if they are not able to be played enough, I will probably look for somepony else to play them. I may even play the characters _myself_ But I thought it might be a nice opportunity to let others who might want to play them with me, get the chance to do so as well!